" The Prophet …It is very inspiring. It is more or less a pattern for everyday living." 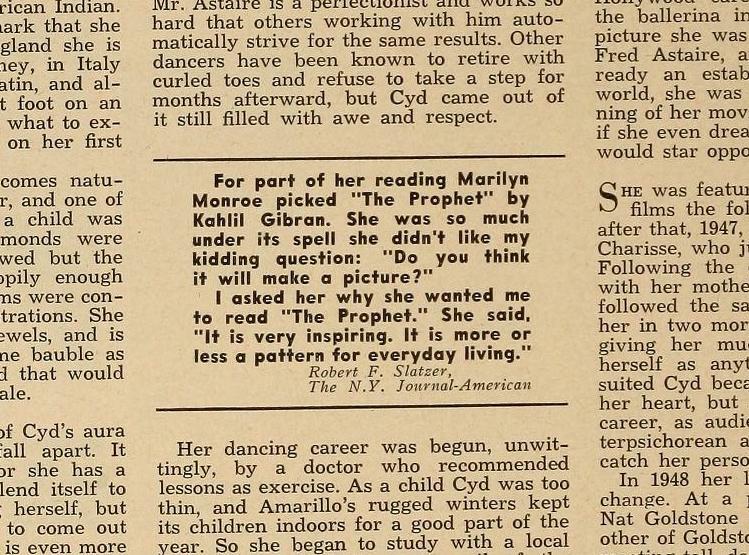 Marilyn Monroe was a self-educated literate, and it may come as a surprise to many that she was like most self-educated people, (including myself) an avid reader of just about everything, with a wide variety of interests. We say ‘surprised’ because, for most of us we may have this image of the iconic Hollywood star standing over a street grate in New York City, with her dress blowing in the air. That picture like many others of hers was perhaps just a cover story for something deeper. Open the book up, so to speak, and you’ll find this woman's intellect and thirst for knowledge was overlooked by the pretty girl imagery her public persona forayed, perhaps fuelled on by her own grassroots ambition, and urged on, by her greedy associates looking to capitalise on her notoriety. As history would suggest, with great fame, comes greater public obligation and scrutiny, which can most often lead to psychological and spiritual burnouts. Self-identifying the real in an idolizing world such as hers may have become too foggy to see through. A condition we have sadly read and seen in many other gifted artists whose careers tottered a similar path. An example of such individuals would have to include the likes of Elvis Presley, Michael Jackson, Heath Ledger, and Amy Winehouse, who after amassing great popularity through their work, found themselves consumed with outward affairs and not with their own personal and spiritual growth. Even our beloved Gibran was not immune to this way of living, for after The Prophet was released, demands for his presence increased; lunches, dinners, parties and literary gatherings, were toppled with the unexpected soul-seeker eager to talk and sometimes ‘confess’ to The Prophet. ‘The Hermitage’2 a name given to describe his New York City apartment was now overwhelmed with visitors, increasingly taking solitude time away from his painting and writing. 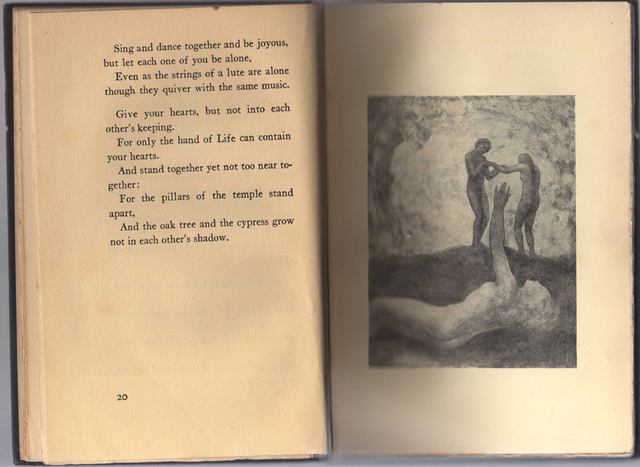 Gibran would often find relief by escaping to family in Boston or The Herkimer summerhouse of the Roosevelt’s. Kahlil Gibran and his Armenian Tapestry inside The Hermitage. Considered one of the hardest modernist novels to read,4 she felt challenged to understand it. Lines such as “ to learn one must be humble-but life is the great teacher” may well have further ingrained Monroe’s juxtaposition of what was not being reflective in the innermost journey that was calling out to her. 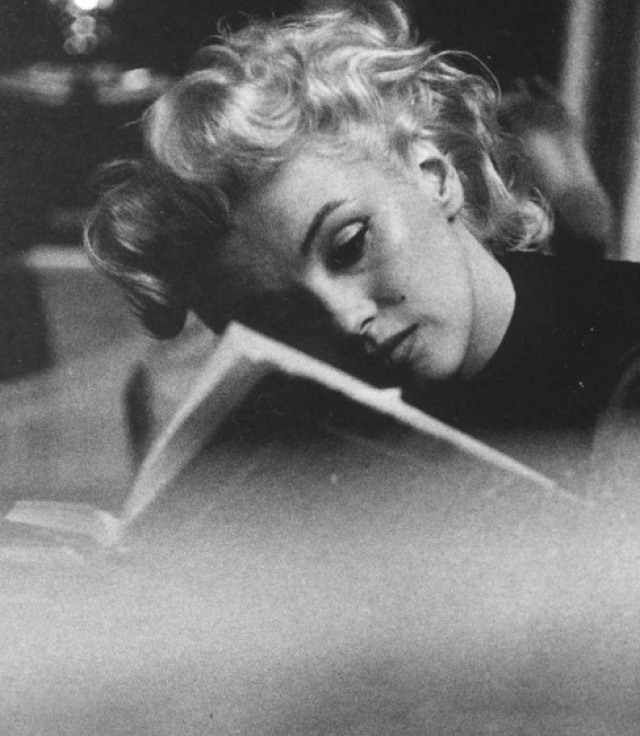 For those lucky enough to have visited Monroe’s home, they would have discovered her sanctuary of 430 books6 One can only imagine the solace and joy they gave her, easing her soul from the frequent bouts of depression and longing. If prompted to talk about them, she may well have greeted you with an enthusiastic review, leaving you inspired to read more for your self. Something all book lovers are guilty of! 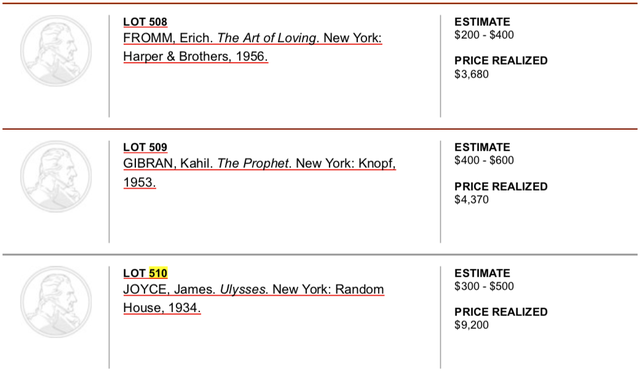 From what we know, The Prophet was one of Monroe’s beloved favorites, often reading it in-between movie set breaks. As like, Johnny Cash and Elvis Presley were known to do, Monroe was noted to have given copies away to people in her circle and kept a collection of four copies herself. 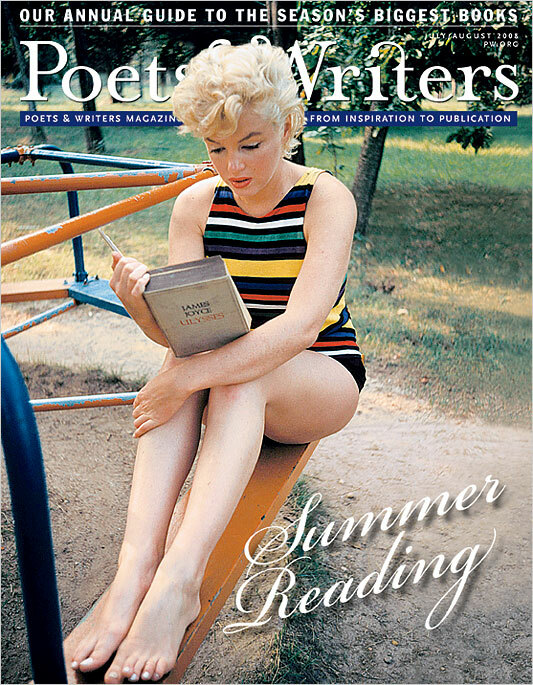 Saltzer, reflecting on an interview he made with Monroe some years after she died, remembers ‘kidding’ about whether or not The Prophet would make a “great picture’ further noting that she was under some kind of “spell” with Gibran’s poetry; to which Monroe replies: " The Prophet …It is very inspiring. It is more or less a pattern for everyday living." I’d like to thank Francesco Medici for his indispensable contribution to this article and the Kahlil Gibran world at large. Over the years, scholars, Francesco Medici, and Glen Kalem have researched and collected books and stories belonging to some of the most amazing and influential people who used Gibran's wisdom in their work or life. This study has inspired them to contribute a new monthly review that highlights some of Gibran's diverse readership across many countries and languages. The Kahlil Gibran Collective will feature a new monthly review on global subjects they deem worthy of study, who either read or were inspired by Gibran or his Works. Robert F. Saltzer - The New York Journal-America. The Hermitage was the name given to Gibran’s New York City apartment at 51 West Tenth Street. Icon: The Life, Times and Films of Marilyn Monroe Volume 1 - 1926 TO 1956 By Gary Vitacco-Robles. Goddess: The Secret Lives Of Marilyn Monroe By Anthony’s Summers.